review: Posh Boutique 2 is an easy, frothy race against time and mismatched outfits... quite like sipping a lukewarm cappuccino on a lazy afternoon. the story: The game takes off after the presumable success of the series' premiere installment - Posh Boutique - with proprietress Alicia on a plane, en route to a long-overdue vacation. But fates conspire otherwise and she wins an in-flight lottery of $1 million (seriously), which propels her to abandon her trip and return to her dream of building more boutiques - international ones this time. 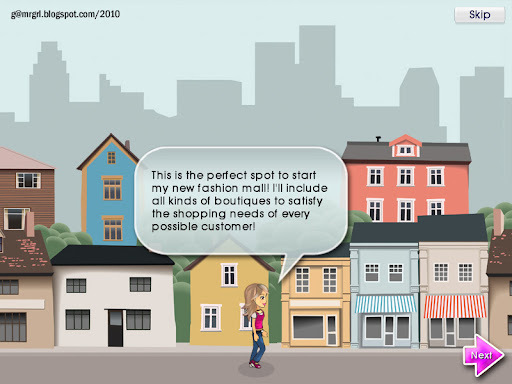 Alicia starts with great ambition - to build 'all kinds of boutiques to satisfy the shopping needs of every possible customer', a mission statement few retailers would dare to voice, let alone attempt to implement outside the world of casual gaming. Soon afterward, she states with equal élan that she doesn't really care about income from her stores; her true interest is the process of building new ones. Her pell-mell management is reflected aptly in grannies dressed in fur coats, leather pants, hippie shades and sparkling white gloves... but let's not get ahead of ourselves. 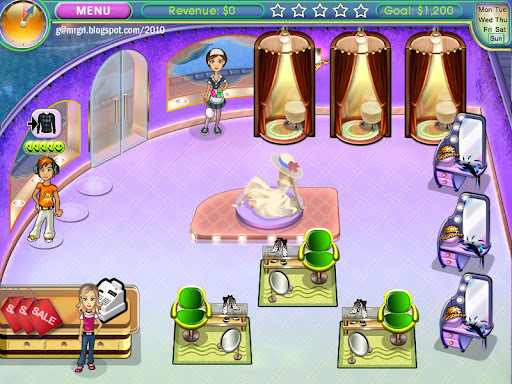 game-play: Like its story, Posh Boutique 2 offers negligible originality of game-play. Alicia has to equip and service 6 boutiques, including one in a television tower, one underwater and another inside a hot air balloon. She spends a week at each location, totaling 42 'days' i.e. levels for the game. 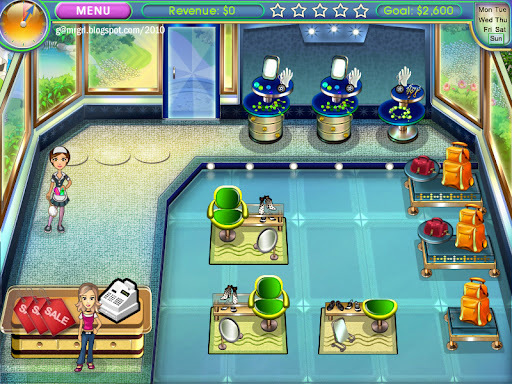 Alicia is a hands-on tycoon and attends personally to each customer, helping them pick out their item(s) of choice via three simple mini-games and billing them at the cash counter. One item selection mini-game is a static image match with 9 options, another a moving carousel match, and the third a scroller match - requiring the options to be scrolled through till the correct one is displayed. Customer types are few, with no distinct traits except minor differences in patience levels. In addition to the usual retinue businessmen and 'optimistic women', teenage boys and girls, kindly elderly - in this case a granny with a puppy and a 'sporty grandpa', Alicia's all-purpose boutiques are also frequented by couples who must be served simultaneously (but who pay individually), VIP buyers and journalists. The last two categories of guests are naturally more entitled to tantrums than regular folk; even then they display exemplary patience by the standards of this genre, and spawn two more mini-games. The journalists aka 'press' require certain items to be located in the store in a rudimentary hidden object search, and based on the time taken, rank the store on a scale of 1 - 5 in their reviews in 'Boutique' magazine. 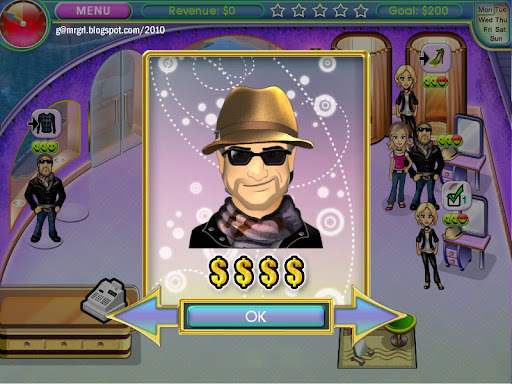 This glory translates directly into additional sales, each star earning an extra $100. The VIPs, meanwhile, return to the store after closing time for personal consultations with Alicia, who must interpret their (literally) hazy thoughts into actual items within a given time for extra revenue. Alicia likely spent her lottery earnings in buying the stores, since there's no evidence of the moolah in her day-to-day operations. She starts every store from scratch, building up from the 2 basic counters each of three items - combinations of clothes, hats, shoes, gloves, accessories, sunglasses and luggage - to 3 advanced counters of each, and her only help is a cleaning girl. The interior upgrades, including two speed upgrades for Alicia and one for the cleaner, are focused on increasing capacity and efficiency of the stores. Alicia also uses her earnings to jazz up the storefronts with mannequins, garlands and posters, which then attract more customers, improve their moods (indicated as smileys) and increase their inclination to purchase. Each customer can have three to five smileys - depending on store upgrades - that determine their level of happiness, or lack thereof. Depleted smileys can be refreshed, and deleted smileys reinstated, with prompt service and attention. Alicia can also dole out always-gratifying discount coupons, generated automatically at intervals, to guests who are sufficiently agitated. Posh Boutique 2 takes a detour from the usual concept of 'combos' - chaining actions for bonus points - to introduce its own take: single customers who want the same type of item can be combined into groups i.e. combos of two or three, which increases both their patience as well as propensity to purchase. Similarly, it puts a new spin on trophies earned for achieving preset milestones. 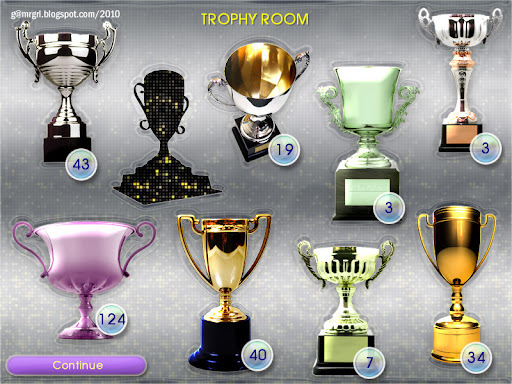 While most games hand out a trophy only the first time a target is met, here the player can win each trophy repeatedly, with numbers counting up each success. A third unusual game mechanism is that once a boutique or individual level is deemed completed, it cannot be replayed without restarting the game from the very first level, a caveat that may have posed a problem if the game hadn't been unbelievably easy. 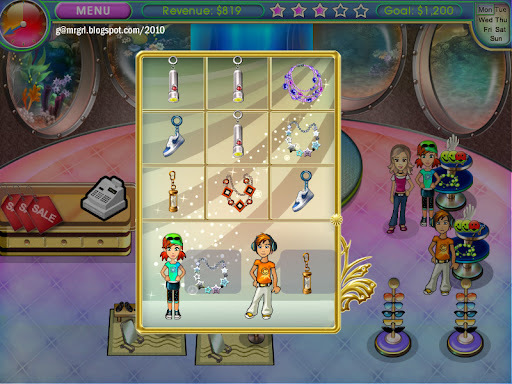 The 'Ultimate' mode of the game, available once the Standard mode is completed, allows the player to select the boutique and mini-game type for each of the three items before unleashing a relentless stream of customers on Alicia while constantly upping both the difficulty level as well as store upgrades. Ironically, the fast-paced action of the side show makes it far more interesting than the dawdling main event. There is a mini-game on the start screen too - each day Alicia thinks of an item that appears in a thought bubble beside her head. 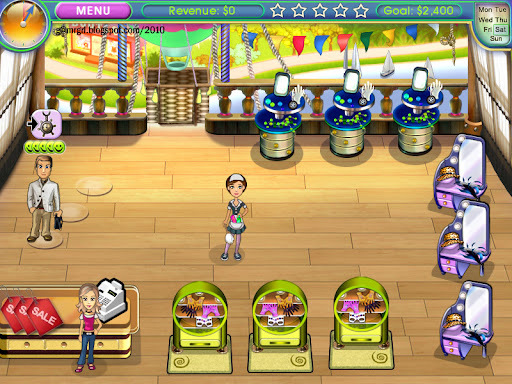 The player can earn $1000 by selecting the correct item from the carousel near her feet. While extra cash never hurts, the game does not require the money desperately enough to warrant exiting to the start screen 'daily'. 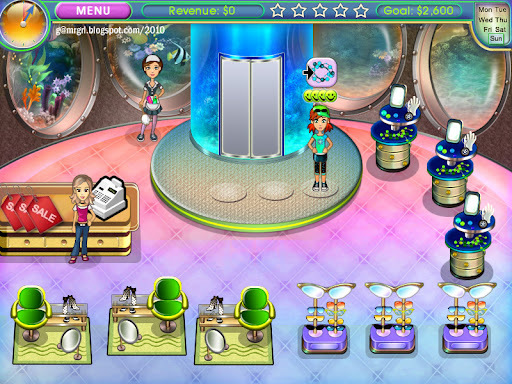 art & graphics: Posh Boutique 2 has above-average, cheerful art that works overtime to brighten up the dull proceedings. The clothes and accessories are intricately detailed when seen in close-ups, as are storefronts and shopfloors. Alicia is generically pretty, and her customers are well-rendered as well. 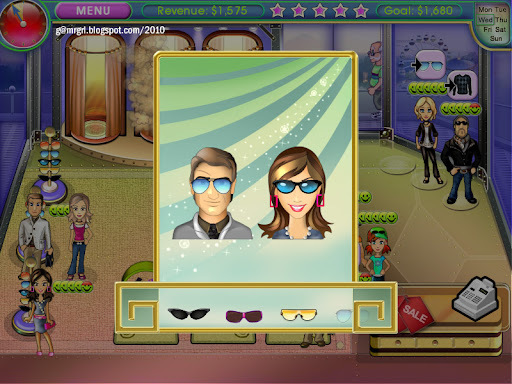 The small 'movie' at the start is devoid of animation barring a sliding background, but there is considerable, smooth in-game animation, both of characters and effects. The interface is easy to navigate with large, clearly demarcated hotspots. I faced trouble occasionally while trying to place customers in their slots near item counters, but that's a small speck in the overall superior efficiency of the interface. text, sound & music: Alicia's story and thoughts are narrated via sparse speech bubbles; the rest of the text is functional and generally free of spelling and grammatical errors. The music is unremarkable - ordinary loops played in the background that do not really register other than to keep the tempo going. Likewise for voice-overs - a few sound bites repeated throughout the game, though mercifully none of the clips are annoying enough to jar despite constant looping. 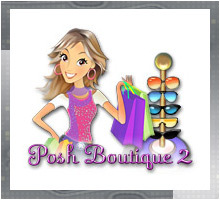 bottomline: Posh Boutique 2 is a generic product, and nothing about the game suggests otherwise. The mash-up of time management, object matches and hidden object searches is easy to the point of being lame - both Basic and Expert goals are eminently achievable till the end; if anything, the slow trickle of customers keeps Alicia unoccupied and waiting for large intervals of time. This, when combined with the overly simplified game-play that exempts mistakes and penalties, all but eliminates the sense of urgency that normally accompanies time management games. This game should have been a high octane race; instead it's a short, leisurely stroll through the neighborhood mall.